The T-5 Ford was exported to Germany without the Mustang name due to a vehicle there already named the same. The T-5 was available from 1964 to 1979. This amazing 1968 Sunlit Gold T-5 Mustang comes to us from Mario Sikorski of Ingolstadt, Germany, and was our featured Attitude Of The Week for December 7th, 2008. Mario tells us that his T-5 has been restored, has all its matching factory numbers, and according to the Marti report this is a one of a kind. 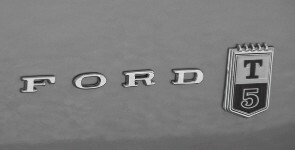 When these cars were exported to Germany, Ford could not register the "Mustang" name for sale. Ford replaced the "Mustang" emblems with "T-5" emblems. T-5 Mustangs exist from 1964 through 1979.